Cast: Brandon Routh, Kevin Spacey, Kate Bosworth, Frank Langella, James Marsden. Story: The man of steel pops back to Earth just in time to save it. Running Time: 2hrs 34 minutes. It's been a rocky ride for Superman Returns, with two previous directors mercifully leaving and the cast being up in the air (ho ho) for several years. In a controversial move, unknown Brandon Routh gets to wear the spandex in this new outing, and he does it very well. The more-than-passing resemblance to Christopher Reeve certainly helps, and his performance takes more than a few cues from the late Mr Reeve too, which is no bad thing. The remaining two lead roles are fielded by the two stars of Beyond The Sea - Kate Bosworth and Kevin Spacey - while Bosworth is nowhere near as watchable as Margot Kidder's original, Kevin Spacey triumphs over Gene Hackman, creating a whole new Lex Luthor - smart, funny and deliciously evil, with a huge dollop of screen presence. Spacey and Routh run the show here, the others may as well go home. As we would expect, the 20 years since the last Superman movie have been filled with advances in visual effects, and the new technology is used freely and effectively here. Although some scenes are a little over-ambitious, resulting in the viewer momentarily snapping out of the magic by noticing the wires (figuratively speaking), on the whole the special effects are marvellous and add significantly to the atmosphere, as you would hope and expect from a movie with X-Men's Bryan Singer at the helm. Singer knows how to do superheroes and he captures the essence beautifully, flashing back to Superman's childhood and indulging in swathes of dramatic flair just for the hell of it - I love it. I couldn't believe it when I saw the running time was over two and a half hours - it feels considerably less than two hours, such is the captivating nature of the movie. So it's a straight 5/5 then? Well, sadly no. Whilst hugely enjoyable and highly accomplished, the coveted five-star rating is stimied by some rather loose plotting. The story goes that the first four movies happened, then Superman popped off home for a few years, then came back. In the meantime, everyone - Lois included - has forgotten that Superman and Clark Kent are the same person. Strange that, don't you think? We can forgive that though, we can accept that as an axiom and run with it, but we can't accept the climax of the movie breaking the rules that have been set up before. I shan't reveal the details for fear of spoiling the moment - suffice to say that the tension builds nicely in a he's-forked-now, how's-he-gonna-get-out-of-this-one kind of way, the viewer already having thought about and dismissed a couple of solutions as being impossible - then the script goes down one of those impossible routes anyway, blithely dismissing one of the hard and fast Superman rules in the process. That's totally unacceptable in my eyes. This deflating moment caused me to sadly reflect on that direst of endings, Independence Day, and to a lesser extent the recent Flightplan. Writers - if you can't think of a plausible way out, don't send the plot in that direction in the first place, it's not fecking rocket science. Fortunately, the rest of the movie is good enough to make up for the schoolboy plot error, so I can still heartily recommend the movie, despite my reservations. Superman Returns is a wonderful superhero movie. The frankly stupid save-the-world moment costs it the fifth star, but nevertheless I wholeheartedly recommend everyone to go and see it. Testosterone Satisfaction Rating: 4/5 - all good clean fun, lots of excitement along the way. To enjoy this film you should be: braced for the duff bit. Superman Returns was released in the UK on 14th July. Superman Returns is simply fantastic, it could never fill Reeve's boots but Routh does an excellent job and at times it's as if Reeve has returned. 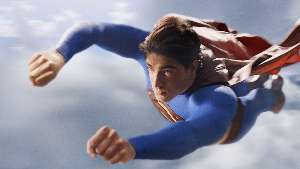 The basis of the film is that same as ever, it's been five years since Superman (Brandon Routh) disappeared from the city of Metropolis without a word and went to see if anything was left of Krypton, he returns to earth, get's his old job back, however Lois Lane (Kate Bosworth), is now engaged to the editor's (Frank Langella) nephew, Richard (James Marsden) and has a five year old son, Jason (Tristan Leabu), lot's happened in the time he's been away. Fortunately our master criminal Lex Luther (Kevin Spacey) has an audacious and evil plan, having discovered how to harness the power of the crystals he knicked from the fortress of solitude, and having acquired enough kryptonite to kill Superman once and for all.